Kulkmann´s Gamebox - Tanto Cuore - Oktoberfest! Since Dominion has been published, I love playing deck-building games. So I am always looking for the ultimate new deck builder that is still better than the one before. Over the years, I have played lots of different games of this type with various background stories, differing playing mechanics and different styles of graphics. Some games I loved, some games I didn't and some were even not worth trying out. Tanto Cuore is a game I first came in contact with at SPIEL 2011. A lot of young women, all dressed as maidservants, explained the game to the interested visitors. Although the game looked to be quite interesting, I was not totally convinced by the presentation and the theme. So I did not take a copy and indeed never played the game since then. But I saw the game (and the maids) in the next years again and again in Essen, which lets me assume that the game should be quite successful. Last year was the time for me to check out the game again. The reason was the release of a new stand-alone version, called Tanto Cuore – Oktoberfest. This version promised to give me a new access to the game. Drinking beer at the Oktoberfest, being served by nice waitresses is much more to my taste than this pure mansion – maid theme of the original version (although there are normal maids in this game, too). Of course Tanto Cuore – Oktoberfest is still no gender-sensitive game. It uses a slightly revealing anime style and there is no single male waiter. But hey, it is still Oktoberfest and compared to some other games by JAPANIME GAMES most maids in this game are “sufficiently” clothed. Basically Tanto Cuore is quite a traditional Japanese deck-building game. Most of the mechanics we know from other deck-building games. Especially Dominion has a lot of similarities to the game. So you “buy” cards from a general supply to expand your deck. In Tanto Cuore you use love points instead of money or gold for that, and instead of purchasing the cards you are employing new staff, most of these waitresses and maidservants. 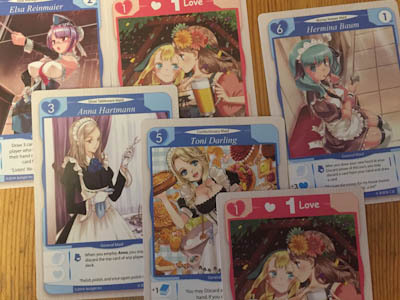 Our starting deck only exists of love cards (the currency of Tanto Cuore) and some Matilde maids which serve us to generate victory points in the final scoring phase, but are quite useless during the game. As you can see, very similar to Dominion. The new staff however has stronger effects and also differs slightly from the well known pattern. Next to the normal playing area, where you play your serving (comparable with action cards in Dominion and love cards, you have a private area. In contrast to your normal playing area, cards in the private area stay in play and have various positive or negative effects to the owner during the game or in the final scoring phase. Some of the maids can either be played in the normal way or they can be added to your private area with different effects for your game. Now the new sequel Oktoberfest is not only a stand-alone version of the game, bit it also introduces a new type of cards, the beer cards. Those beer cards (of course it is Oktoberfest) can be acquired by playing two different bar maids. Beer cards sometimes have special effects, too, but more importantly is to collect the right type of beer, because they count as victory points dependent on how many cards of a specific kind you have collected at the end of the game. Quite useful is the fact, that beer cards are sent to your private quarter, too, so they do not spam your drawing deck. 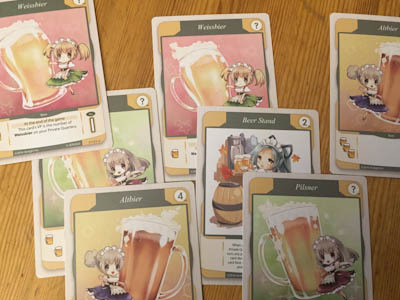 But you must be careful: beer cards have an alcohol level and there are two cards in the game that demand the players to count up their alcohol level. Depending on your current alcohol level this can lead to a loss of beer cards again (if your character has drunk too much). 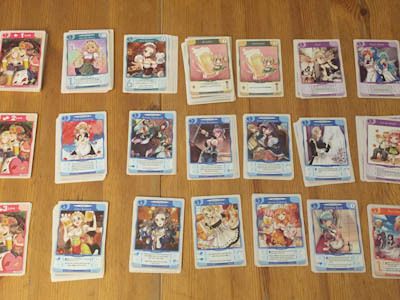 Players who know Dominion should have no problems playing Tanto Cuore – Oktoberfest. In fact, there are a lot of similarities as far as the game mechanics are concerned. Of course the effects of the cards are quite different and Tanto Cuore – Oktoberfest also introduces some new elements. But the real innovation are theme and graphics. If you like the anime style I think you will love the illustrations of the maidservants. Unfortunately the rulebook of the game cannot match up to this high standard. So it is only a small booklet in black and white. Some more examples of play in the rules wouldn't be the worst thing in the world.